Our son Dominic was admitted to Alberta Children's Hospital Sept. 12, 2013, diagnosed with acute myeloid leukemia. He died Sept. 3, 2015. 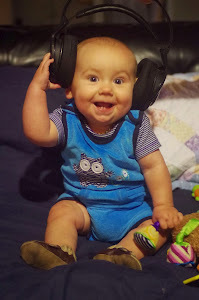 This blog tracks his journey - and ours. Play games. Heal kids. Sounds simple, right? Since 2013 I've participated in a charity that does just that. It's called Extra Life. When Dominic was diagnosed with AML, people wanted to help. While we certainly needed assistance ourselves, finding a way to give back quickly became a way to rally all of the good will towards something bigger than our family. 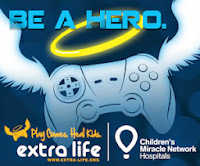 Extra Life began in 2008 when Jeromy Adams, a guy from Houston, Texas, decided he wanted to do more than just collect games to be donated to his local hospital for kids to play. He realized there's an untapped demographic of video game and board game players out there who would love nothing better than to use what they're passionate about to give back to their communities. His idea? Do a 24-hour gaming marathon, get folks to sponsor you, then have all the money you raise go to your local children's hospital. The idea has exploded. In 2013 more than $65,000 was raised for Calgary's Alberta Children's Hospital. The 2015 total was upwards of $200,000. Gamers sign up at www.extra-life.org, pick their hospital and start raising money. They can even make or join teams and win T-shirts and medals if they get to fundraising targets! I raised more than US$4,000 in 2013. It was tremendously rewarding to know I'd given back a little bit. Jeromy visited Calgary in spring of 2014 to help kick-start a guild, a new volunteer group dedicated to convincing more people to sign up and participate in Extra Life. At the time, Dominic was in the ICU so I dropped by. I got involved with the group and have done plenty of promotion in Medicine Hat as well. In 2014 I raised upwards of US$8,000. The year Dominic died we had a whole team behind us and combined for US$46,000. We've now raised more than US$100,000. Extra Life 2018 is slated for Nov. 3-4 and Trish will now play as well. Our story has been something of an inspiration to the folks with Extra Life, to the point they sent a film crew to help share it. The 11-minute video debuted at Extra Life United, an annual tournament-style event we attended in Orlando, Florida in February 2016. You can see it at the top of this page. Needless to say we plan to be involved with Extra Life for a long, long time. Sean Rooney. Watermark theme. Powered by Blogger.